Have you ever gone for a walk with your dog and noticed they are having trouble walking? Do their nails click as they move on hard tiles? If your answer is yes, then it is time for a little nail grooming. Grooming should come with excitement, but trimming dog nails is feared by both the owner and the dog.Dogs which stay indoor most of the time needs more trimming as compared to dogs which spend a lot of time outdoors. Long nails can be harmful especially to children around. Long nails cause twisting of the toes which is very painful. Long nails sometimes make walking painful for your pet. Did you know that dogs have sensitive toes and feet? Therefore it is important to make trimming fun for them. Stroke their paws gently, rub their bellies, head, give them treats and kisses will help both the dog into cooperating. Talk to them, a lot of aahs and oohs will do. It is advisable to let the dog lie down when getting the trim instead of standing. Most of the time, the dog adopts the attitude you give it. If they sense fear, they will also fear to trim the nails. You have to act like it is a fun activity. 1. The best way to give a trim is by cutting bit by bit instead of guessing where the quick is. The quick is a blood supply vessel and if cut by mistake could cause a lot of bleeding. 2. Therefore, since the quick grows at the same pace as the nails, it is always safe to cut the part which looks flaky and dry. If trimming is done weekly, it will be impossible to get to the dogs quick when trimming. 3. Before cutting make sure you have a sharp nail trimmer. I recommend the guillotine type because it is easy to use on dogs. 4. These trimmers have a stationary ring which the nail is placed through, and a cutting sharp blade that moves up to cut off the nail, when trimmer handles are squeezed. 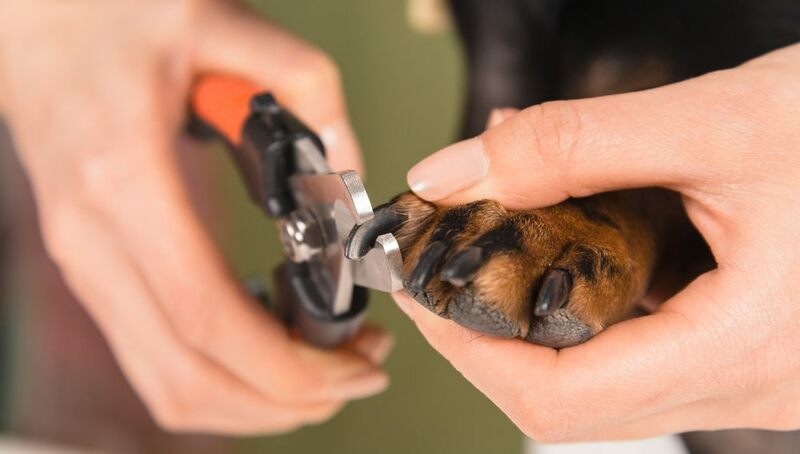 According to Dr. Leslie Woodcock DVM, the best way to cut your dog’s paw nails without hurting the quick is by cutting the sides of the toenails in an angling way. It is easier to cut dogs with white nails because one can see the quick. The quick is usually the pink part at the toe base towards the nail tip. Clip the toenail slowly and cut bit by bit, leave some small distance between the nail and the quick. For dogs with black nails, extra caution is needed. The only way to gauge where the quick is is by cutting the dry nail bit by bit. Stop when you reach the less hard part. The same should be applied to the dew claws. Alternatively, I prefer placing pressure on the nail before cutting it. If I get a reaction to form the dog, I know it is near the quick, if I don’t get any response, then it is safe to cut. What If You Cut The Quick? We all dread the part where you cut the quick and your dog starts bleeding, but it happens accidentally, you should have styptic powder ready to apply the bleeding paw. Alternatively, you could use Regular baking flour, baking powder, corn-starch, baking soda and baby powder. The bleeding lasts for around five minutes. Place the powder in a big container with a large opening that can fit the dogs paw. If you happen to cut the dogs quick by mistake, you can quickly dip the dogs paw into the jar. It is faster and simpler than taking small pinches and applying.​ Toolsinsider.org helped me in this part of article. Since some dogs are very impatient, you can trim two nails per day, always award them with treats after every trim for example dog biscuit. For a better experience, cut the nails after a bath because they are softer.